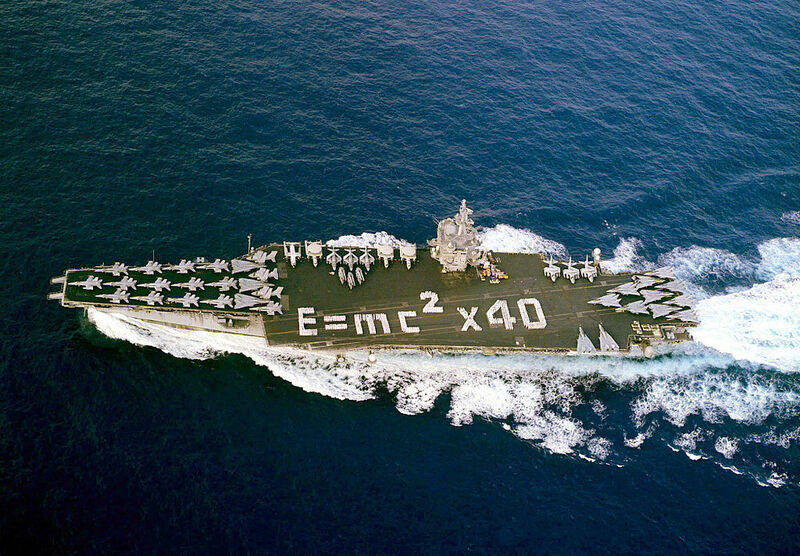 Sailors aboard USS Enterprise spell out “E = MC2x40” on the carrier’s flight deck to mark forty years of U.S. Naval nuclear power. U.S. Navy Photo by Photographer’s Mate 3rd Class Douglass M. Pearlman. (RELEASED). Courtesy of Wikimedia Commons. When you boldly go where no one has gone before, there are a few things you can count on. Number one: you forgot something. Perhaps it was your toothbrush, your fuzzy socks, or your bath towel. Now, you’re going to have live without it for the duration. As long as it wasn’t your life-saving medication, any and all forms of deodorant, or your spouse’s permission that you failed to acquire before leaving the planet, you’ll find a way to survive it. Two: no matter where in the known Universe you wander, as long as you are still in contact with Earth, the media will find you. Don’t be fooled into thinking that high-speed interstellar travel exempts you from this effect. You can escape gravity. You might side-step Newtonian mechanics, fold spacetime, and slip the galvanized grip of matter and energy. However, the instant you emerge the media will be there waiting for you, lurking casually in your email/twitter handle/blog space or streaming in via the Public Affairs Office. I say this AS a trained, card-carrying, and intermittently proud a member of the media. It’s our job to be there anytime news breaks. Broken laws (civic or physical), broken hearts, and broken records are our specialty. If there’s an interesting story in the offing, expect us there. Please and thank you. Lastly, now that the internet exists, if you do something figuratively or literally outlandish there’s one more thing you can expect: the palpable, if incorporeal, presence of the public. That’s good! We’re here for the the betterment of the species, after all. We’d bring you all with us, but there’s not that much room in the dome and someone needs to keep the trains running on time, etc. The best we can do without bending the laws of physics to the breaking point is to try to speak to you from afar. To that end, when the 8-month HI-SEAS crew “returned to Earth” last year, they opened up a Reddit “Ask Me Anything” chat. That produced a lively discussion. If we were back on the blue planet, we would probably be doing the same right about now. Suffice it to say, we’re still Mars-bound. We overtook the last crew’s record weeks ago and are still coasting onwards toward the finish line, some 95 days from now. Irrespective of our Red-Planet status, the “Ask Me Anything” light is green. A Reddit user submitted a request addressed to “someone on the HI-SEAS IV crew”, which our Earthside mission control passed onto us. We’ll be doing our best to answer the posted questions in a timely fashion. If we really were on Mars, timely would be about 9 minutes, minimum. Mars is nearly in conjunction with the Earth. In about six days, your planet and ours will be the closest we’ve been in a decade. That will bring communication time down to just over 4 minutes each way. So walk outside sometime this week and wave. Or, leave us a question on AMA. Or write to us on our blogs. Any way you choose to ask a Martian your question, we’ll be pleased to answer it. We like it when people say hi. It makes us feel human. The Apollo 7 crew encouraged letters, too. Photo By NASA. Transferred from en.wikipedia to Commons by Jatkins. 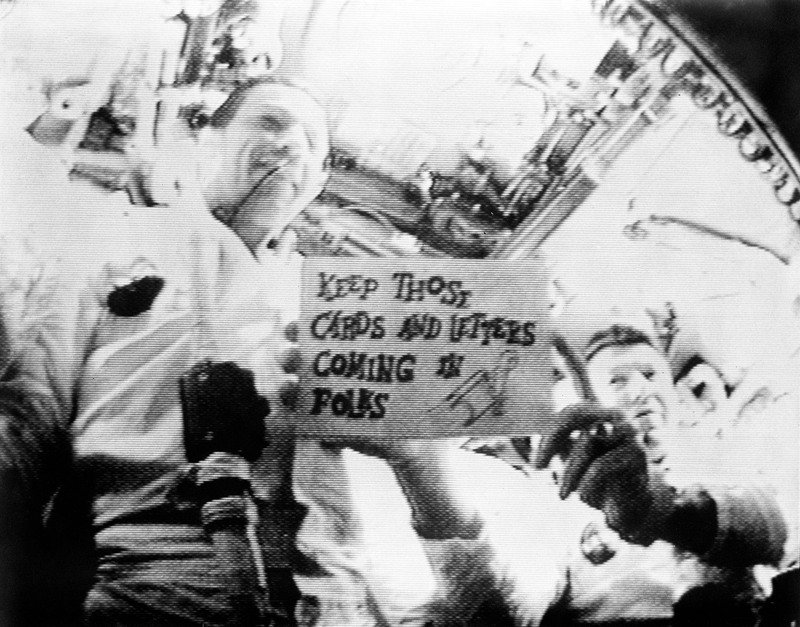 (Original text: NASA), Public Domain, Wikimedia Commons. Hugs & love to you Shey! We miss you. Hi there, awesome crew! Nice project, not easy to complete, congratulations! I have a question: how you’ve changed after this long period? Hi Adrian: That’s a good question. Speaking only for myself, I’ve become immensely grateful for the things that I have here: food, shelter, intelligent company – as well as the things we normally take for granted back on Earth. I have a profound appreciation for how difficult these sorts of missions are to plan and execute. It’s not small feat. I’m extra-grateful for my friends and family back home, and for humanity in general, who have been increadibly supportive, helpful, and curious. You all are why we do this, and I’ll never forget everyone’s collective kindness during this time. Amazing job you are doing. After nearly a year, knowing all the consecuences of the isolation, do you really think that a expedition to Mars will succed? Can really human being deal with all the problems of isolation, reduced space, food, communication? Seriously can we? Thanks a lot! Nice perspective.